In a medium mixing bowl, mix all ingredients together. Roll into small meatballs, about one inch diameter, and place on a baking sheet. 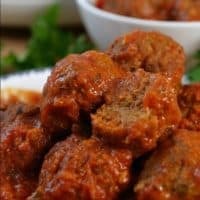 Remove from oven and place meatballs into smaller size crock pot. Pour spaghetti sauce into crock pot, gently stir and turn on high for 4 hours.